Is the quality good (I sure hope so, as they are expensive!)? Are the locks to open the panniers easy to use, or fiddly? Do you really need inner liners? Are they a faff to easily and quickly remove and attach to the bike? When fully loaded - do they add a lot of noticeable weight and changes to handling ? I haven't done much mileage yet but I do like the Ducati panniers - they really suit the bike's nice looks. Locking is fine , removing and refitting is easy . Not sure how waterproof they are as I haven't had any real riding in heavy rain yet.I did buy some e bay pannier liners for them for perhaps about £40 - not Ducati's - and they fitted really well and are well worth the money to organise the things in the pannier.I haven't noticed any real difference to the handling and , as you say they are narrower than the bars - so filtering is not probem, Having had my recent spill I can say that the left pannier took a real hit on the road and whilst the pannier was a write off (one locating lug broke off - that would be the only weakness - but I was able to temporarily fix it with a bungee cord) it did save a lot of expensive damage that would otherwise have been taken by things like the frame and engine casing - so in that sense it saved a lot of money ! Thanks for the feedback. All sounds positive. Yeah, I'm not a fan of aluminium panniers , as you say, they just don't suit the Duke. Have you got a link to the ebay site where you got the liners from? The same company from which I bought liners for my Pan. They are excellent quality and have have held up well over the years. I really like them. 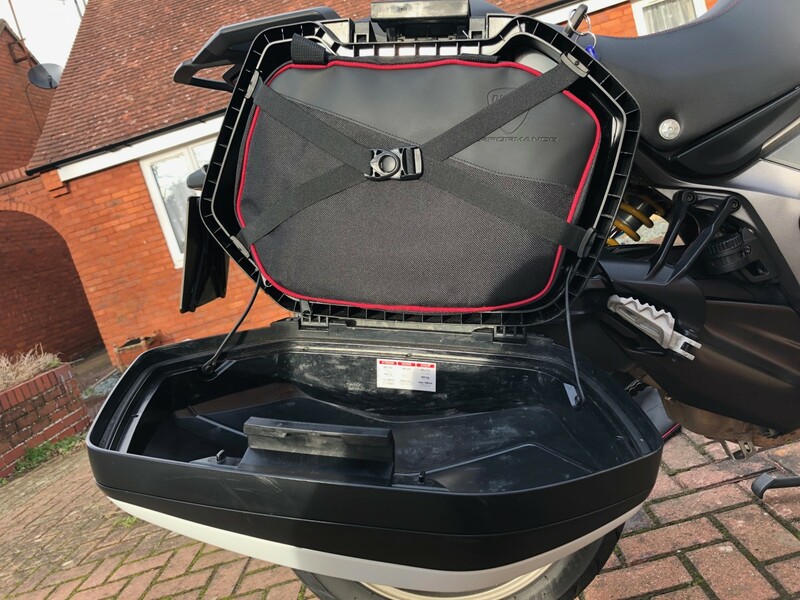 I can get my Arai Tour-X in the top box with room to spare and my jacket (compete with body armour in the left hand pannier. Taking them on and off is a doddle. They look like they were meant to be there and the bike looks good when they are fitted and when they aren't. I had the Duc panniers for 4 years on my Multi 1200 GT. Adding them to my 950. They don't need mounts to be added that is one huge benefit. The keys match your bike key, the colour matches your bike. I got the touring pack with center stand for about $900 US plus the colour inserts maybe $125. 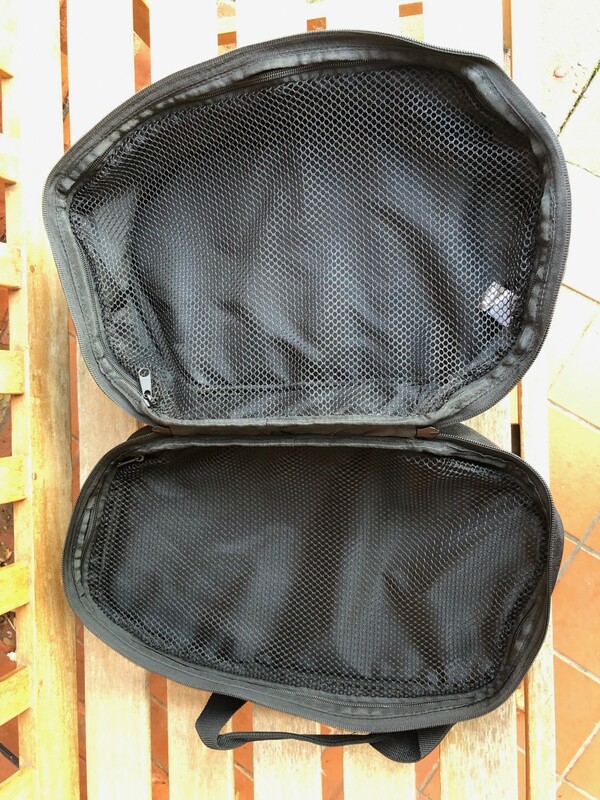 The liners match perfectly so get a set of those too - two zipped compartments and straps that hold them in. I love them. They are a little finicky to attach until you get the hang of it. Are they heavy? as bags go they are super light - no frame to add. If you pack them full of tools and cans of beer - they get heavy! Now what is handy but SUPER ugly is the massive tail case. Handy because 2 helmets, along with your gloves etc fit with no issue. Also no straps, easy on off but to me it ruins the look of the bike, so I am trying the SW Motech Jetpack. It matches my SW Motech EVO tank bag, (which is just a perfect tank bag for a multi IMHO) works like a backpack. We'll see how it goes. I may end up also getting the big ugly for a long trip but my daily will be the Jetpack. I will report back soon. I have both touring and urban kit on my bike and I always leave them on even when I go scratching!!! They are very practical and stilish and really suit the bike.... better to get them with the bike as you can save a lot of money that way! 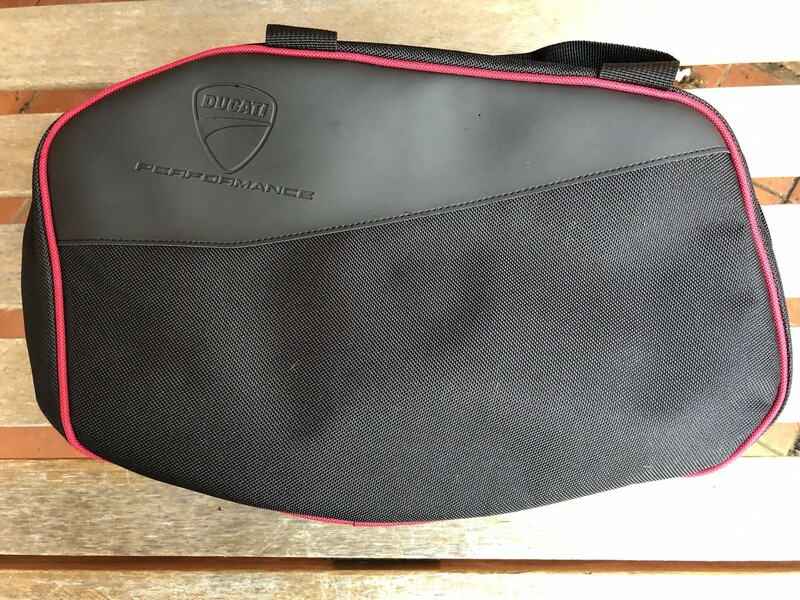 I started my hunt for some pannier liners & after trying some universal ones from eBay didn't like the fit so I ponied up for the official ones 96780521A be careful to buy the correct ones as other Multistrada ones are a different shape. the exhaust side is tapered for the "lump" my only down thought is they could of been a little deeper as they only fill the bottom part of the pannier so the lid space is still empty space.